I can’t get Howard Rheingold out of my head! His video ’21st Century Literacies’ seems to be on a loop in my head. This is posting is loosely connected to ocTEL activity 2.1 about exploring colleagues readiness to engage with TEL. I haven’t done it as suggested but I did participate in a focus group this week on engagement with our VLE. I didn’t consider it particularly useful to think further about why people didn’t engage (lack of time and skill as a sweeping generalization) but to spend time on what might encourage them to start. As earlier posting on motivation, purpose and mastery clearly have a place but I’m not sure that gets the T-avoider out of the starting blocks. I am interested in the potential of participation as a motivator. 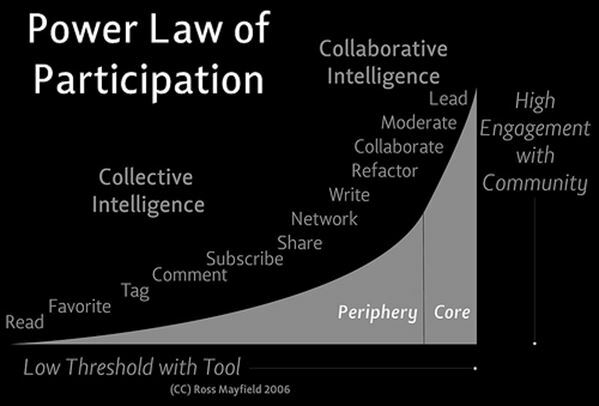 This graphic shows a way this participation can build. The social aspect may then encourage further participation to the point of collaboration. Possibly over-optimistic but I like the fact that all forms of participation count. In my experience it is almost impossible to get beyond the ‘lack of time’ argument and almost not worthwhile engaging with people on that basis. I am in no way saying that colleagues have loads of time by the way. Yes I think activity would help. If it was well supported it would get more out of the starting blocks with some tools. Just some small steps in the direction of TEL via ‘have a go’ sessions. This is really what the learning bytes sessions do but only for the enthusiasts. Perhaps if they were restructured – this is what others have done / have a go (supported session) / feedback their impact could be increased? I am still wondering how you get people to attend in the first place though – it must be better to do these sessions with colleagues. This then shares the load, offers encouragement, makes a change more likely through a broader ‘buy-in’, has potential to build momentum. Getting people involved (particularly those that dont want to) is probably the hardest aspect of TEL. Great post and a really useful graph I think. thanks Jo. It strikes me also that you need the right medium to facilitate the participatory activities that are shown on the Power Law graph. VLEs don’t have them. Also that you need either a shared sense of purpose and a goal oriented community or an engaging /identity oriented community to get people participating.